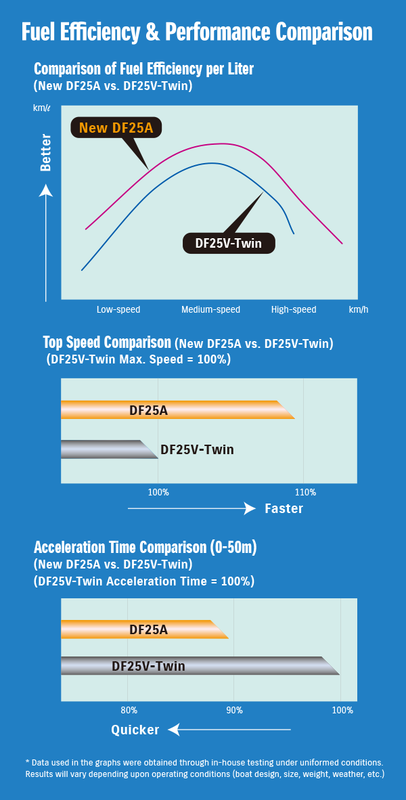 Suzuki engineers have packed the new in-line three-cylinder DF25A/DF30A with some of Suzuki's finest technologies giving them class-leading advantages that put them ahead of the rest. 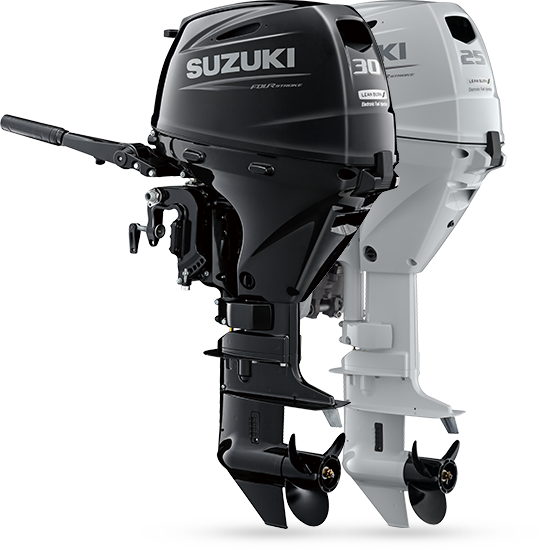 Engineering lightweight outboards has long been a Suzuki hallmark. Both are first in class to feature friction reducing roller rocker arms and each utilizes offset crankshafts resulting in smoother operation and greater mechanical efficiency. An LED monitoring system provides engine operating status at a glance. Suzuki's highly efficient four-stroke technologies produce lower emissions that allow outboards like the DF25A/30A to conform to some of the world's strictest emissions standards*1 including the EURO 1 emissions Standards (EU Directive 2003/44EC)*2, and receive a three-star rating from the California Air Resources Board (CARB). Emission standards compliancy is region specific. The EU emissions standards (exhaust gases and noise levels) set by the European Parliament and Council. Lightest outboards in the 18.4kW (25PS)/22.1kW (30PS) four-stroke outboard class*3. *3:According to in-house investigations as of February 2014. A remarkably compact and lightweight fuel injection system is designed to fit into these outboards without adding unneeded bulk or weight. What's more, it operates without a battery and still delivers quicker starts, smoother operation, and more acceleration in all conditions. This intelligent fuel management system predicts fuel needs by monitoring engine performance and operating conditions to deliver a leaner fuel mixture to the engine. The result is remarkable improvements in fuel economy. 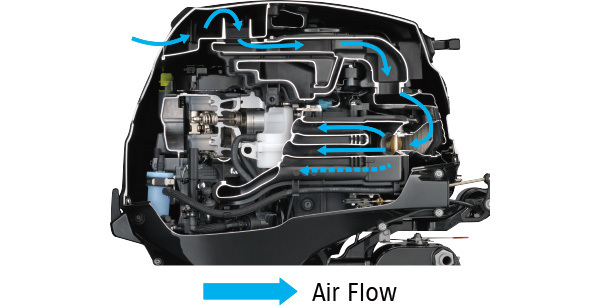 The rotating flywheel helps reduce temperatures inside the engine cover by venting warm air to the outside from the recoil cover, inner air intake, and engine upper cover. Fuel injection delivers easier starts, but Suzuki goes a step further incorporating a very light recoil starter into these outboards. Requiring less pull strength, the Easy Start Recoil Starter makes starting the outboard quick and easy. The LED monitoring system utilizes three LEDs to keep you informed of current operating conditions. Located in an easily visible position, the LEDs provide easy to understand monitoring at a glance so you can enjoy a pleasurable boating experience. To help protect the engine from damage caused by salt, sand, and dirt that can build up in the engine's cooling system, the outboards are equipped with an easy to access freshwater flush port to make cooling system flushing as easy and convenient as possible.